Slow Cooker Baked Sweet Potatoes are a perfect, easy, holiday side dish your guests will love and it only takes a minute of prep work! 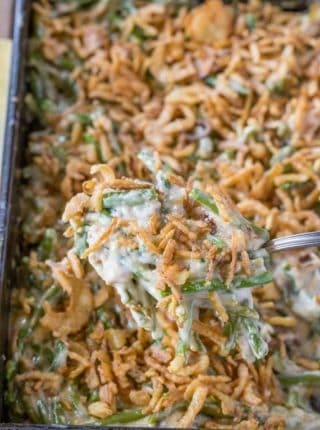 We love serving this during the holidays with Roasted Turkey, Green Bean Casserole and Macaroni and Cheese. Or if you’re all about starches, add Mashed Potatoes on the side too! Slow Cooker Sweet Potatoes are an easy sweet and savory side dish to add to your dinner table. With so many delicious ways to serve them, this will quickly become one of your go-to recipes. Most people end up using up valuable oven space baking sweet potatoes when you could be multitasking with other recipes. Plus if you use your slow cooker (crockpot) you can keep the sweet potatoes warm in it so they are perfect for a buffet spread too. It’s fall which means peak season for sweet potatoes has begun. Because you know I love my slow cooker recipes (and you do too! ), it only seemed right to share one of the easiest ways to serve sweet potatoes using one. In fact you know how much we love our crock pot. 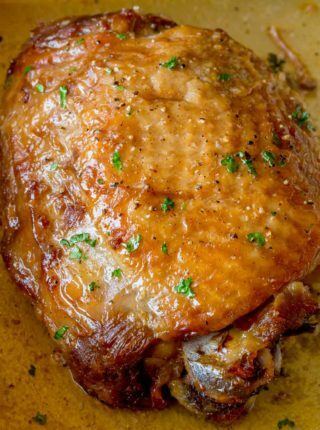 I have a whole list of delicious holiday options for you to make in your crockpot. I know most people aren’t as obsessed as me, but I have a closet full of crock pots. Slow Cooker Thanksgiving Dinner (for 2!) <— entire dinner for two folks! Can you make sweet potatoes in the slow cooker/crock pot? Absolutely and the best part is that you aren’t taking up any valuable oven space making it a great choice especially during holiday cooking. 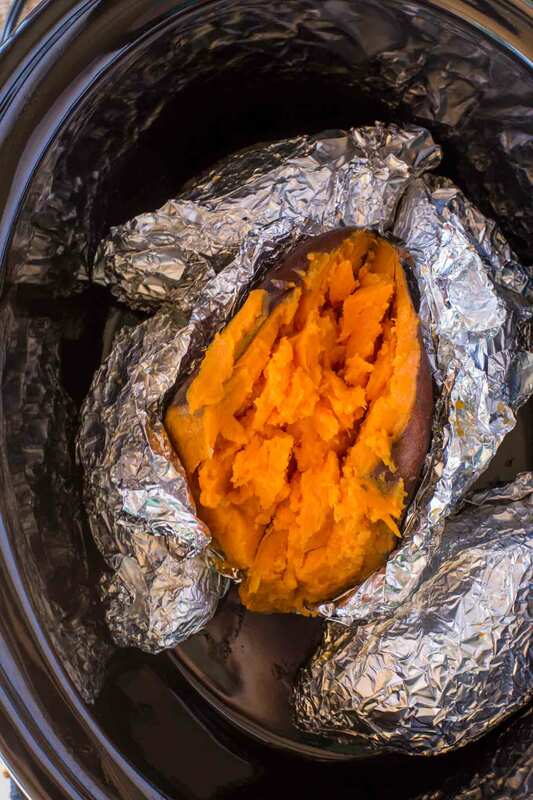 How do you make sweet potatoes in a slow cooker? First you’ll want to wash and scrub the sweet potatoes to get remove any residual dirt on the skin. 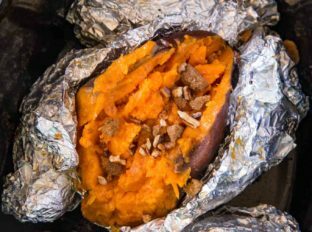 Using a fork, poke holes all over it and then wrap the potatoes in foil. Place them in the slow cooker and cook on low for 6-8 hours or on high 3-4 hours. How do make sweet potatoes in the oven? Use the same instructions as above but place them on a baking sheet and bake them in oven at 350 degrees for 1 – 1 1/2 hours. Once cooked and tender, cut the sweet potatoes open and season with salt and pepper. Top with butter and a sprinkle of brown sugar or try drizzling honey and cinnamon over it for a sweeter taste. Add a little texture with chopped pecans. Turn this side dish into a main dish by spooning your favorite meat over it. 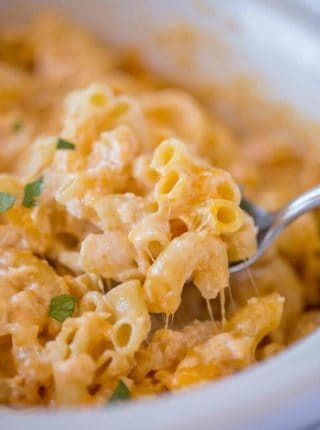 Try ground turkey or chicken and topping with cheese. If you want to make mashed sweet potatoes using this recipe no need for them to be peeled, just cut the cooked sweet potatoes in half and scoop out the potato flesh into a dish. In a medium saucepan, warm up the butter and brown sugar mixture and pour over the sweet potatoes and mash using a masher or hand mixer. To make a sweet potato casserole, add a streusel topping and press mini marshmallows on top, place in the oven for 10-15 minutes. To toast the marshmallows, place them under a broiler for 1 minute at the end. They both have their benefits, but sweet potatoes take the lead with providing more Vitamin A and C, having fewer calories and carbs and offering more fiber than its white potato counterpart. Are sweet potatoes gluten free? Yes. Gluten is a protein found in grains and since potatoes aren’t grains, they are gluten free. 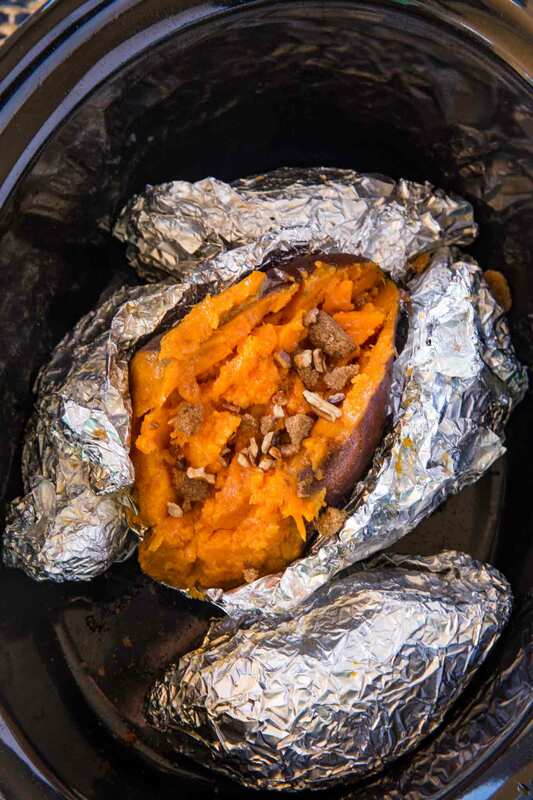 Wash and scrub the sweet potato well and using a fork, poke holes all over it then wrap the potatoes in foil. Put them in the slow cooker and cook on low for 6-8 hours or on high for 3-4 hours. I will definitely try them but what you picture are not sweet poratoes which are lighter and more fiberous than yams which is what is pictured and what I prefer. Many times this mistake is made. Yams are what is usually meant when saying sweet potatoes. Just FYI. Sweetpotatoes are the perfect dinner side! I love this recipe! So easy, right?! Happy to hear you enjoyed them! These are my favorite slow cooker sweet potatoes! They come out perfect every time! Such a great easy hack for Thanksgiving – this will save so much space in the kitchen! LOVE this sweet potato recipe! Perfect for the holidays when I need to free up some oven space. Yes, makes juggling all the dishes so much easier. 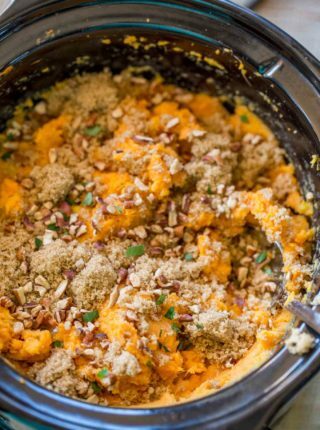 we love sweet potatoes but I’ve never thought about cooking them in the slow cooker!! thanks so much!